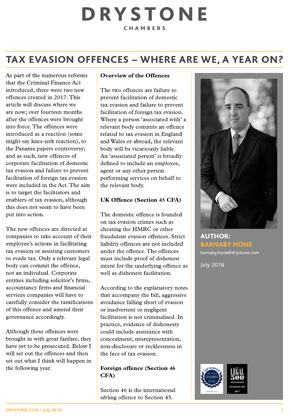 Tax evasion offences – where are we, a year on? Barnaby is hosting a Criminal Finance Act update seminar at Drystone Chambers on Tuesday 25th September 2018, starting at 6pm. He will discuss where the headline changes in the way we are regulated occur, how the various provisions of the Criminal Finance Act 2017 have been used, provide some hints on tips on how to deal with cases where these provisions are used, and finally will discuss how he expects the provisions to be developed. Places are limited, so pre-registration is required. To register your interest and reserve a place, email our Marketing Director Brett Carver (brett.carver@drystone.com).